I don't know what just happened but the email went out before I wrote it. Oh well, I love talking to Utah and the web guys. Forgive us. I just wanted to say hello and give you some up to date news. Margy is vacationing with her hubby and friends in Costa Rica. We know she is having a great time and can't wait to see the pictures of the zip ride and the vegetation. She will be back next week and so here I sit writing to you-all. This is something I really enjoy and so I have decided to change the format a bit and have weekly columns that you can look for. The columns will consist of a favorite, what's new at the shop, updates on classes and now and again "A Challenge"
Have you ever watched ABC News on Saturday morning, well I did last week and saw the cutest thing and so we decided this would be a great challenge for all you clever people. They receive videos from the around the country, we will just receive the written words, describing the submitters week in three (3) words, yes, 3 and only 3 words. So as I drove to the Patch, I tried to sum up my thoughts on quilting in just three words and wasn't too successful. Margy tried and she is still working on it. We decided what a great thing to cover our windows with the three words that are quilting to you. You can email or drop them by. We will give away three $30.00 Gift Certificates, chosen at random to the writers. You have until the 15th of July to bring them in and share you thoughts. Now come on....think... what is quilting to you in three words or what does it mean to you this week, whatever you want to do. Examples: Love feeling fabric; cuddling under - terrific; It is Bound; Quilting completes me, etc. So let's see what you can come up with to describe quilting. I bet they will be terrific. Okay, you are asking yourself what is a "Steady Betty." Well, it is just about the best thing to come along and assist you in pressing not ironing your pieces as you piece a block. It is made of a foam like cover (both sides can be used) but it sure doesn't act like foam. (Foam in our opinion would curl up and disappear if you put an iron to it, well this sure doesn't.) It keeps you from stretching your pieces. It is fantastic!! I will quote what two ladies said after using the Steady Betty "This is the best block I have every done, it went together so easily." I asked it they used Steady Betty and they said "Yes." I said "Thank, Steady Betty." They went and bought them and are amazed at their results. There are three sizes 12 x 12;16 x 16 and 15 x 24 inches. They are $38.00 - $58.00. We have them in stock. Bring some of your pieces and use the one we have in our classroom and you will be wanting one. Best new invention to quilting this year thus far. Oh, my gosh, did I say we didn't go to market.....well, the UPS and Fedex Man don't know that. The boxes are arriving, patterns and new books abound....the Patsy Thompson Feather book and botanical quilting books are to die for. Wait till you see the wool and Halloween patterns that have arrived. They are so great. We are doing them in fabric. More new batiks have arrived in from Benartex and Hoffman. 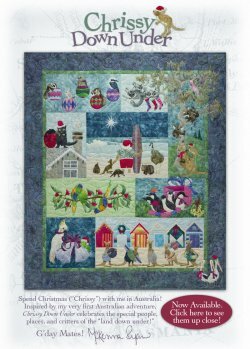 New purse patterns and did we say that McKenna Ryan had done a new Christmas block quilt....Chrissy Down Under. What do you think? We have the patterns in stock. What can we say that the website doesn't already? Here is a link to the classes http://www.jampatch.com/classes.htm There are some new classes added to the June, July and August schedule so be sure to take a look. We are receiving many sign-ups for our newest venture the Christmas Hand-stitched Academy. You are all invited and rather than reprint it all, here is another link that will show you all about it. Christmas Hand-stitched Academy There are samples at the store for you to look at and decide. We are receiving request for a Saturday session and we are looking into it. This should be a fun day. It is Thimbleberries weekend with Friday and Saturday from 10am to 2pm your club meetings. Hope to see you-all. Forgive my computer errors, no the challenge was not to read the blank space (LOL), and I am afraid I can promise you it will probably happen again until I get better at this new computer age.